(Bloomberg) -- Indian stocks will accelerate gains in the lead-up to the election next month as foreign investors pile back in amid a "sharp underperformance" in the market and earnings growth that’s expected to top the region, according to Goldman Sachs Group Inc.
Equities of Asia’s third-largest economy were raised to overweight from marketweight -- just six months after Goldman downgraded them -- analysts led by Sunil Koul said in a report on Monday. The Nifty 50 index will reach 12,500 in 12 months, implying a 9.1 percent gain from Monday’s close, while earnings growth this year is expected to climb 16 percent, they wrote. Foreign inflows have picked up “as market expectations for a potentially stable government have risen in recent weeks,” Koul wrote in the report. His team said investors can buy "short-dated Nifty calls, value cyclicals and oversold quality mid-caps to participate in the current rally." They also favor banks and domestic cyclicals over exporters and defensives. India’s foreign inflows are leading Asia, with net foreign buying of $5.2 billion. Half of the amount has come in March, according to Bloomberg data. The Nifty 50 has rallied 8 percent in the past month and recovered 65 percent of its year-to-date underperformance against the regional MSCI Asia-ex Japan Index, Goldman said. 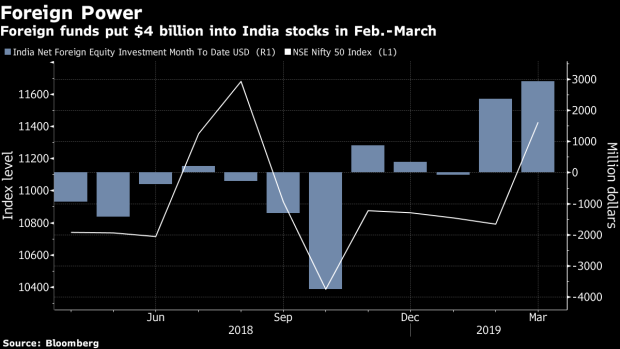 Goldman is changing course on India stocks after the firm downgraded them to marketweight in September, citing economic and political risks and rich valuations. India will unveil election results on May 23 following six weeks of voting in a ballot that will determine whether Prime Minister Narendra Modi wins a second term as leader of the world’s largest democracy. India’s benchmark Sensex Index has gained about 60 percent since Modi secured the biggest electoral victory in three decades in 2014.